From little league sports teams to adult teams, let us provide bus transportation services to get your athletic group there safely and on time! Whether it’s for kids or an adult team playing out of town within Ontario, trust us to provide safe transportation services. Our bus rental services are budget friendly – often costing less than traveling in separate cars – plus it allows your group to travel together. • Youth club teams; hockey, basketball, soccer, football, baseball, etc. When traveling, we can provide pick up and drop off services for your team or remain and provide shuttle services. This may include taking you from venue to venue or providing hotel shuttles to and from games. Athletes and non-athletes alike love taking group trips to Southern Ontario’s world class sporting events. We provide busing to see your favourite teams (we’re fans, too!). Name your destination and we’ll get you there. • BMO Field – Toronto F.C. • A local arena, community field or sports complex near you! The Switzer-Carty Management team is highly experienced working with major sporting event organizers to meet their transportation needs. Whether it’s the Canadian Open at Glenn Abbey or Ancaster’s Hamilton Golf and Country Club or the Pan Am Games – we can help. We’ll help your organizing committees put together a transportation services plan that will ensure your sporting event is a hug success. Contact us to learn more. Need affordable busing? Renting our school buses provides the lowest per passenger cost around. Need adult or upscale comfort? 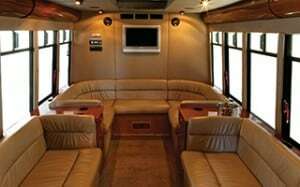 Then travel like a pro (even if you’re not) and hire one of our executive luxury coach buses equipped with stereo/video and air conditioning! See photos of our limo style coach and school bus options here! Why Rent a Bus for Your Team or Event? • Lower Cost. Compared to coach buses, our school buses are a fraction of the cost. Our limo style buses provide excellent, upscale value. • More Passengers. If you’re booking for your team, keep the group together strategize rather than having everyone drive separately. Gel as a team and arrive together, ready to win! • Safety & Trust. We’re trusted by school districts and transit authorities to transport thousands of children and passengers daily. Trust our team to take care of yours! • Logistics Planning. Major sporting event organizers can count on us for professional logistics co-ordination services in addition to a ready fleet of hundreds of buses and professional drivers. Buses for Sports Teams/Events in Your Area! Most of our bus types are available for your sporting events or team needs in areas throughout Southern Ontario, including; Greater Toronto, Mississauga, Brampton, Etobicoke, Markham, North York, Oakville, Burlington, Windsor-Essex County and surrounding areas. School buses are additionally available in Bradford and Simcoe County. Submit the online charter request form or call us we’ll quickly follow up with your group! *Please note we do not presently offer cross-border transportation.